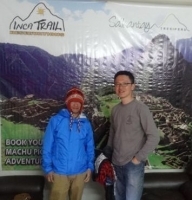 I came to Cusco with a friend to hike the Inca Trail to Machu Picchu. After doing some online researches, I am glad we found Inca Trail Reservations . Most, if not all, of the travel and lodging arrangements were done online in English. The office staff members have been very helpful and responsive. They were able to reserve a very nice hotel near the main square in Cusco for us. When my friend and I arrived at the airport, a local Inca Trail Reservations staff picked us up at the airport. We didn´t have to worry about figuring how to get to the hotel, no stress. The Cusco staff also helped us reserved a City Tour on the first day and a Sacred Valley Tour for our second day. The City Tour starts in the afternoon so it worked perfectly into our schedule since we arrived in Cusco in the morning. I highly recommend these two tours. The tour leader came with a small bus to pick us up at our hotel for both tours. Again, it´s stress free. I thoroughly enjoyed both tours and learned a great deal from the tour guides who are passionate about their works and histories. As for the Inca Trail trek, it was awesome. It´s beyond description; you have to experience it. Inca Trail Reservations had a thorough briefing the night before we leave. Our trail guide, Carlos, came to pick us up at the hotel in the morning and we were off to a fun-filled four days of wonderful experiences. The porters were incredible. The foods were delicious. Carlos helped make the hike a great experience. Overall, I had a great trip with the help of Inca Trial Reservations. He took care of our needs very careful while the trip was getting difficult. He stayed behind us and cheered us while we lost the spirit to go on the trek. His suggestions and briefings on our next day trek did prepare us for the next challenge with peace. His careful heart encouraged us to make the next day easier even thought we were tired to get up. During the trek, his teammates and the porters provided very warm services, meals, hot water and our immediate request in the middle of the trek. He provided flexibility on our schedule according to our necessary. The best activity I liked about this trek is the challenge part to getting up to the Dead Woman's Pass. It was very rewarding when I got to the top of the hill and looked back to what I had accomplished. The best place that I enjoyed to be is Machu Picchu. At there, I could look back to the Sun gate and took photos while the sunlight shining on the top of the ruined structures. I do recommend those who would like to join this trek to bring a good quality light rain jacket for this trek. It is because the weather during my four days and three nights trek changed so quickly. The heat could really get me sun burn in 5 minutes, but might have rain shower in next minutes. A good rain jacket did protect me from getting sun burn or got wet at this time. A pair of good comfort hiking boots is my next recommendation that helped me not twisting my ankles. A pair of ankle guide also endures my strength to the last day as well. I really recommend Inca Trail Reservations !